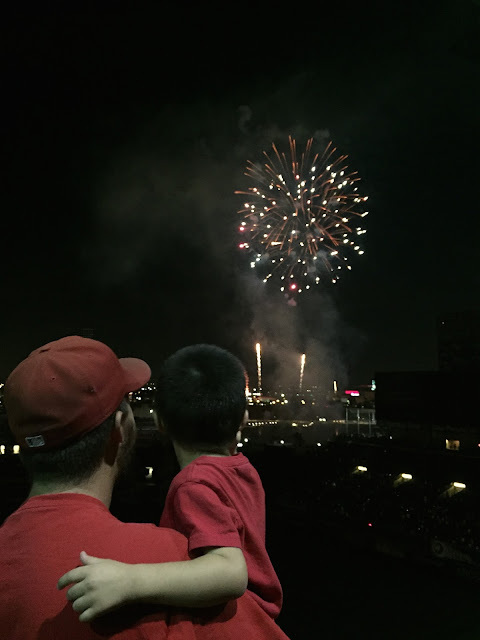 Chasin' Mason: [Go Angels!] Take Me Out to the Ball Game. 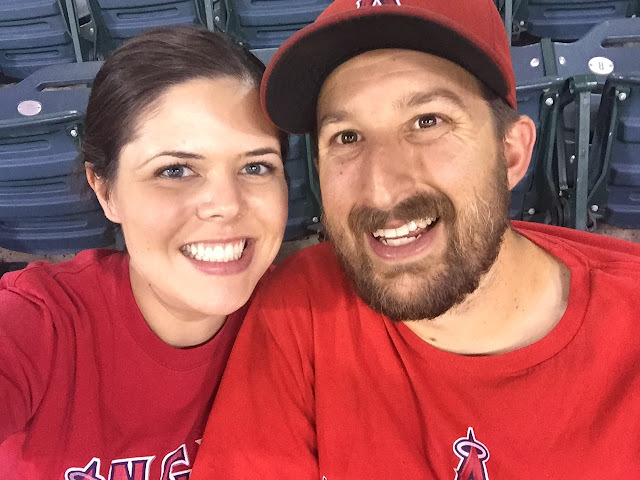 Last Saturday, we went to the Angels game. I can't even remember when the last time we went was, possibly earlier this year?, but it had been too long. Before I met Seth, I rarely watched baseball and really had no interest to at all. 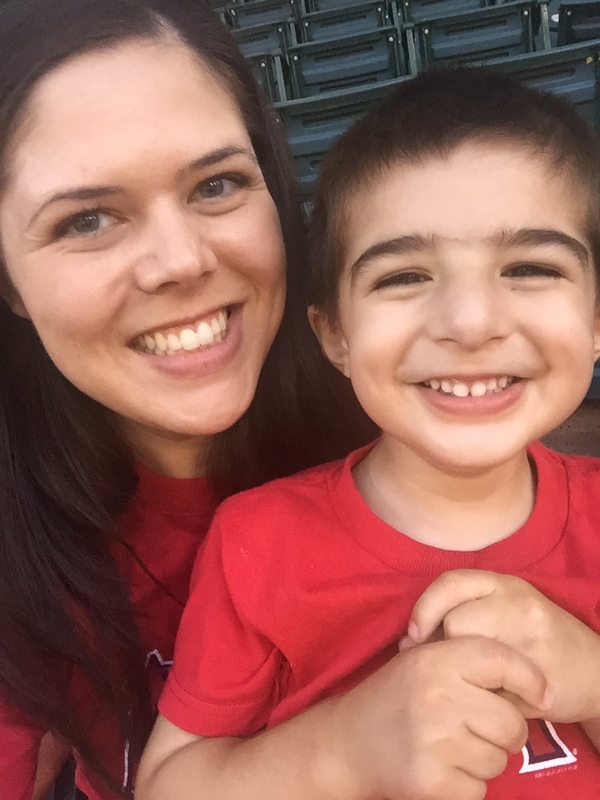 Then I met Seth and he LOVED (loves) the Angels and watches it every night on TV and loves to go to the games. As we started dating, we went to games, and we even got engaged at one in 2009. So, needless to say, baseball and the Angels have become a big part of my life. When we found out that we were having a boy, Seth joked that we would tie his right arm behind his back so he would become a left handed pitcher (in the major leagues, mind you). He was obviously TOTALLY kidding but then oddly enough, Mason was born and we've discovered that he's a leftie. What are the odds?! And while he does like to hit the ball using our little tee ball set, it's definitely too soon to say if he will be a left handed pitcher. Anyway, long story short, we went to the Angels game last Saturday as a gift to Papa for his birthday... back in July. It was supposed to be me, Seth, Mason, and Papa. We didn't think anyone else in the family would want to go (they are more of soccer fans than baseball fans) but then one night my sister in law mentioned that they were thinking about going so we all decided to go together! The kids all did SO well (despite wanting every food known to man that the stadium offered), especially Mason, which is what made this baseball stadium trip so enjoyable. We've taken Mason to quite a few games and we've always ended up needing to walk around or needing to leave early, but he did so well this time. Our seat tickets included tickets for food too so we got Mason a hot dog and a lemonade and he literally ate the whole thing in 2 minutes flat. I was in the process of eating my hot dog when he looked over at me with hungry eyes and so I ended up giving him the rest of my hot dog. He also had a whole bag of watermelon, some fries, and later... a HUGE ice cream cone. Needless to say, he had a pretty great night. He did pretty well with sitting still too and seemed really into the game, cheering and clapping and dancing when music came on. I did have to take him on a small walk around the bottom of the 7th inning which was fine because I had wanted to see if the team store had a bigger size shirt for him anyway. He did great, held my hand the whole time, and actually walked the whole way too (which was pretty far and down 3 levels of ramps and then up 3 levels of ramps)! The game ended, the Angels won, and we got to see the Saturday Night Spectacular fireworks show. I was a little worried about Mason and the loudness of the fireworks, but basically all he wanted to do was sit on my lap and he felt comfortable. He was in awe the whole time and the loud "booming" did not bother him at all. We seriously had the BEST time and I'm super bummed that baseball season is coming to a close. 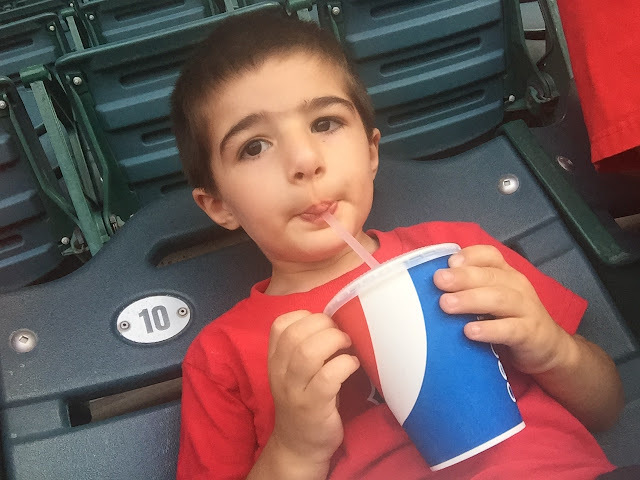 Mason did SO well and seemed to genuinely enjoy being at the game. Until next time... GO ANGELS! It's so cute that he was into this game AND all the food. Really the only reason to go to a baseball game in my mind. Although the last time we went they didn't have nachos. I mean come on. But maybe cheesy fries would be okay. Did they have cheesy fries? A Family baseball night is an awesome activity!!! Brian is dying to go to an Angels and Ducks game come February. 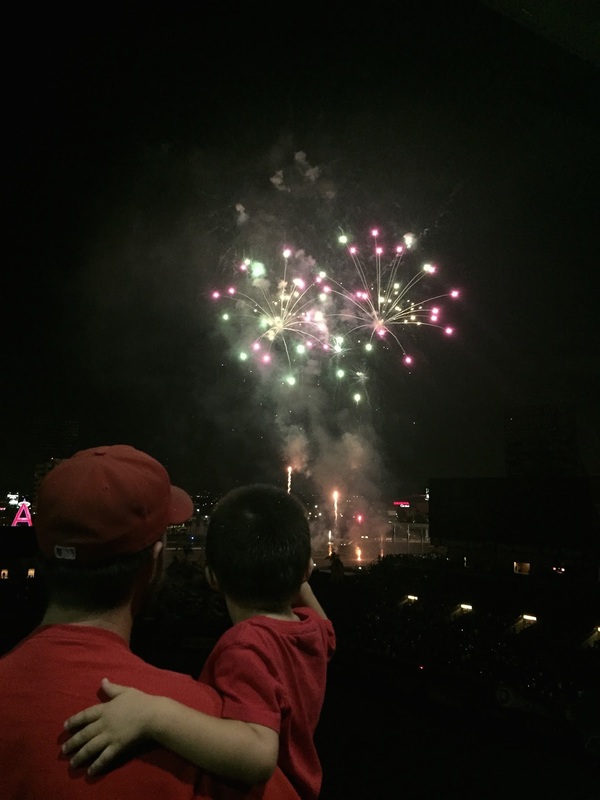 You must have given the Angels luck because they have been in a slump :( Love your pictures those fireworks shots are perfection. Oh that is so much fun! I just love the ice cream face and fireworks photos. Baseball in October is the best maybe you should route on another team that wears red and you'd find out ;) HA! Sorry just had to tease you a bit there. Glad you guys had such a great time together. Oh how fun that it was a family affair! All that food sounds amazing, especially that huge ice cream cone! That's my favorite part of a baseball game ;). Best time ever!! And sounds like Mason did so well!! And dang, I'm so jealous of what a good little eater Mason is!! 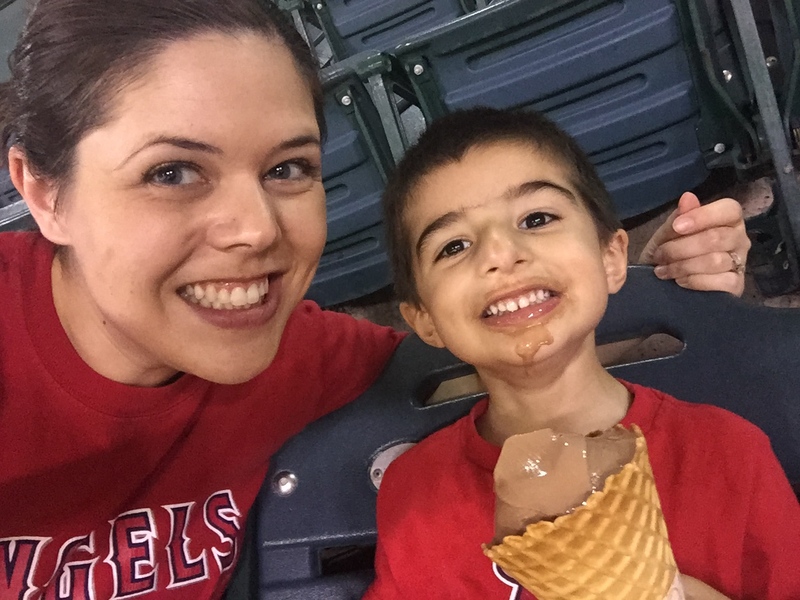 That picture of you and Mason looking at each other while he holds the ice cream cone - heart exploded!!! Looks like a great time! Before Cash Luke & I, along with our friends would go to 10-12 games of the Brewers a season & tailgate for years. Since Cash, I don't think we've been to one. We definitely want to go next season! Haha! It’s so funny how many dad’s dream of having a little left-handed pitcher and a switch-hitter! So cute. Whoa! 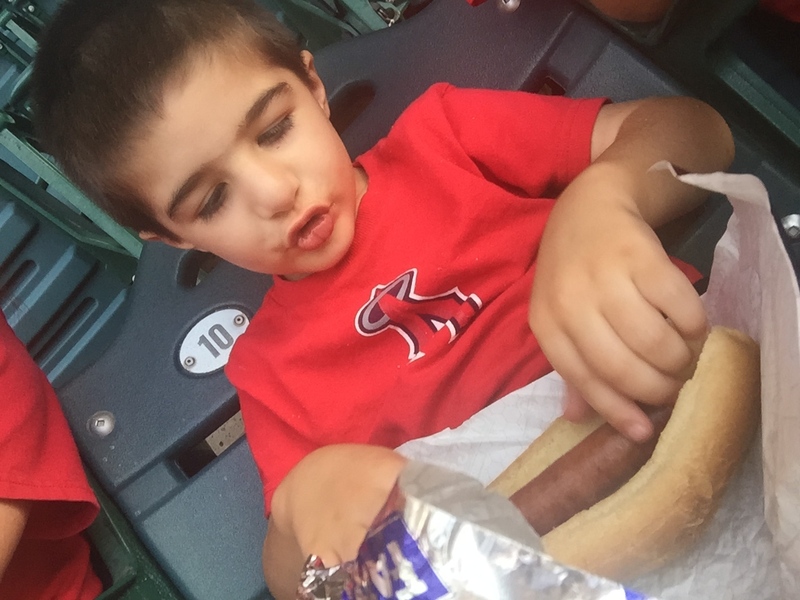 I think it’s safe to say that Mason loves ballpark food! So cute and awesome. What a fun night!!! I love all of the pictures. PS – was there not many people at the game? The stands around y’all look empty!